I was around ten years old when I discovered Jem. Naturally, it appealed to me and I fell in love with the show! My sister got the dolls for presents over the next year or so and I lived vicariously through her. I eventually created my own paper dolls of Jem, The Holograms, The Misfits and each and every supporting character. Every outfit for every character in the show was created and my fascination became obsession! I took a tape recorder to the television and recorded each song, compiling them into mix tapes. Over the last four years, I have been rebuilding my Jem obsession. I downloaded every episode I could find (all of them), I have a CD collection of all the music. With the recent DVD releases, I have the first two seasons on DVD, and am anxiously awaiting the other season to fully arrive. Now, thanks to Ebay, I am collecting the dolls and have nearly made my collection complete! I will post pictures once that is achieved! 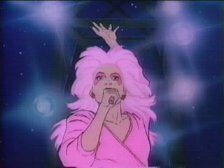 Jem has been a huge source of inspiration for me, and is truly one of the greatest things I have known in my life!